In honour of the Tour de France, this month’s Bostik blogger theme is the bicycle. Running from Saturday July 7th to Sunday July 29th 2018, the 105th Tour de France will be made up of 21 stages and will cover a total distance of 3,351 kilometres. 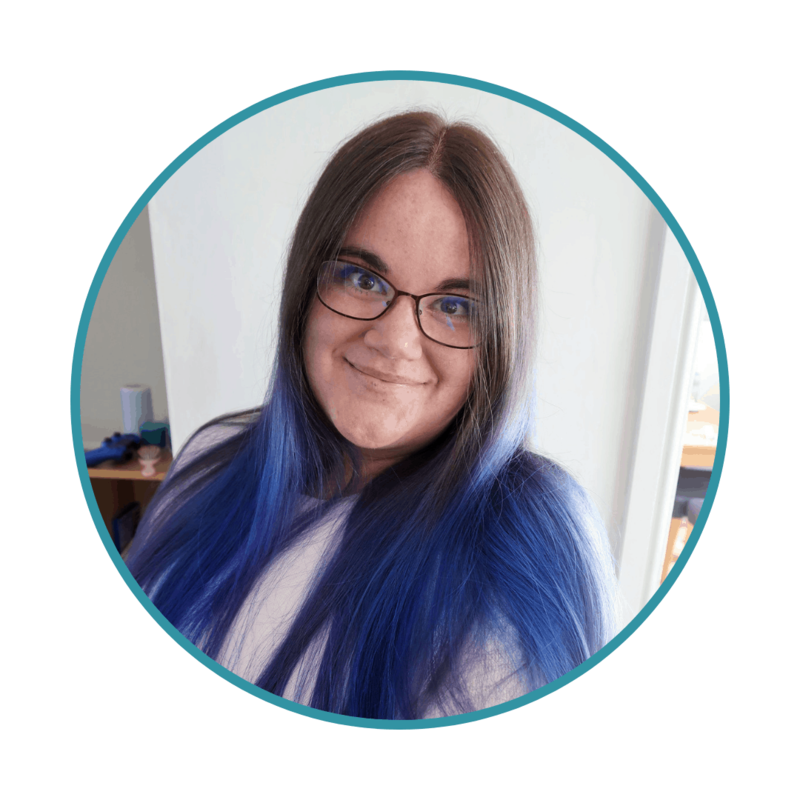 Bostik are official partners of the Tour de France this year and so they are celebrating all things cycling, and all things French, with the Bostik crafting bloggers. 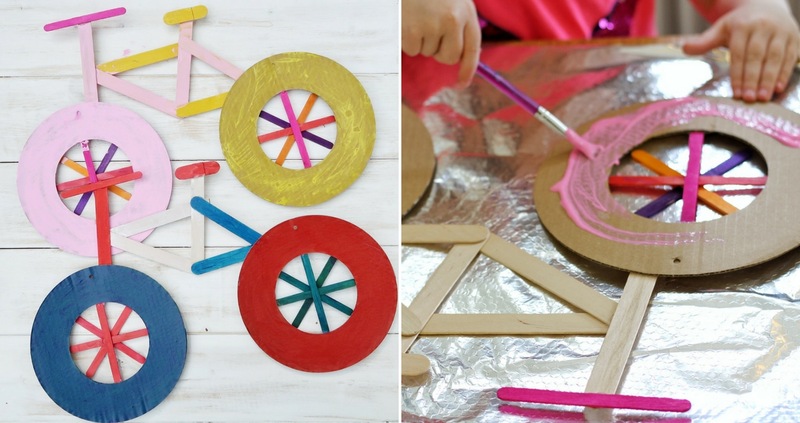 The children and I made these colourful bicycles, using only card, lolly sticks, paint and glue. They look effective enough to hang on the wall and Littlest’s (pink of course) now has pride of place in her room. 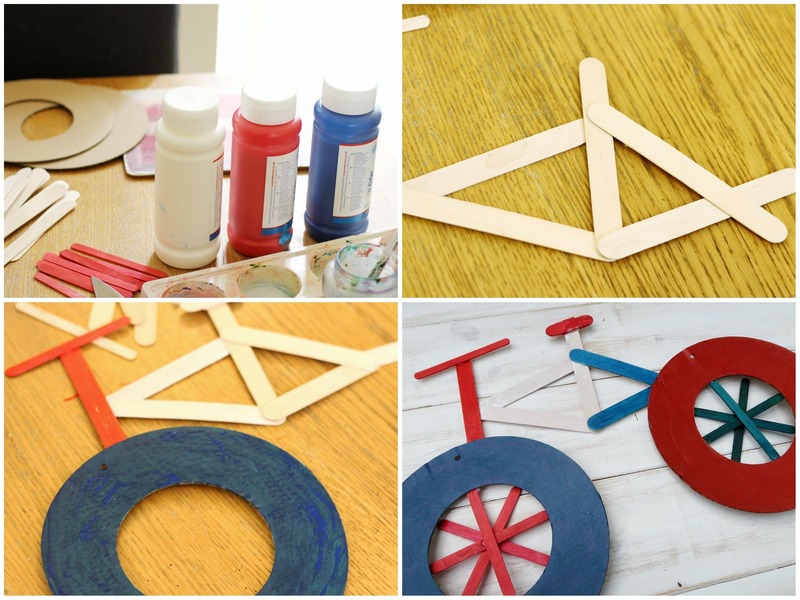 You can find out how to make our bicycle craft below. The first thing you need to do is make the frame, seat and handlebars of the bike. Arrange them in the shape shown above and glue them in place. If you are using general craft glues you will need to leave them to set for a little while. I also used lolly sticks for the spokes and so I glued those into a spoke shape, using four lolly sticks. I then glued those to the inside of the wheel. 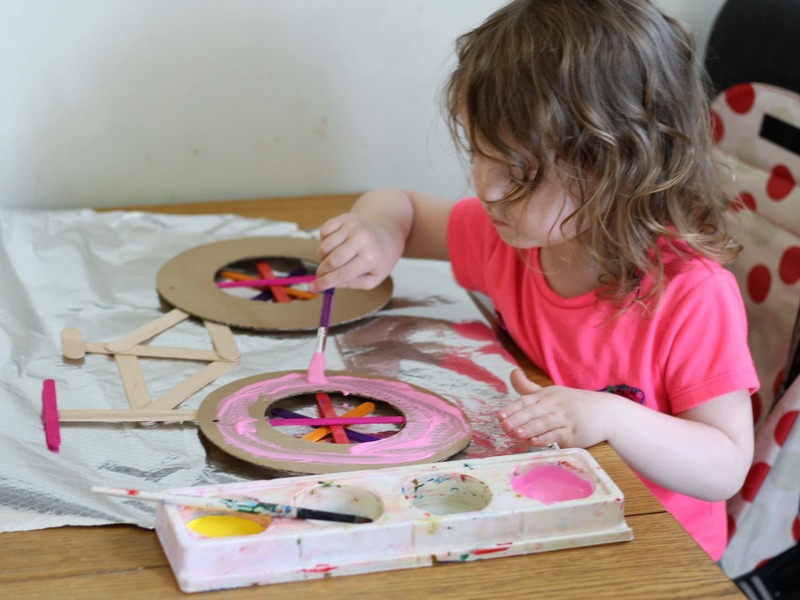 If you are using paper plates, you will need to cute a circle in each one first, in order to create the wheel shape. You could also use string for spokes. Simply make holes around the wheel and thread in through holes, weaving a spoke pattern. Tie off and stick down with tape at the back when complete. 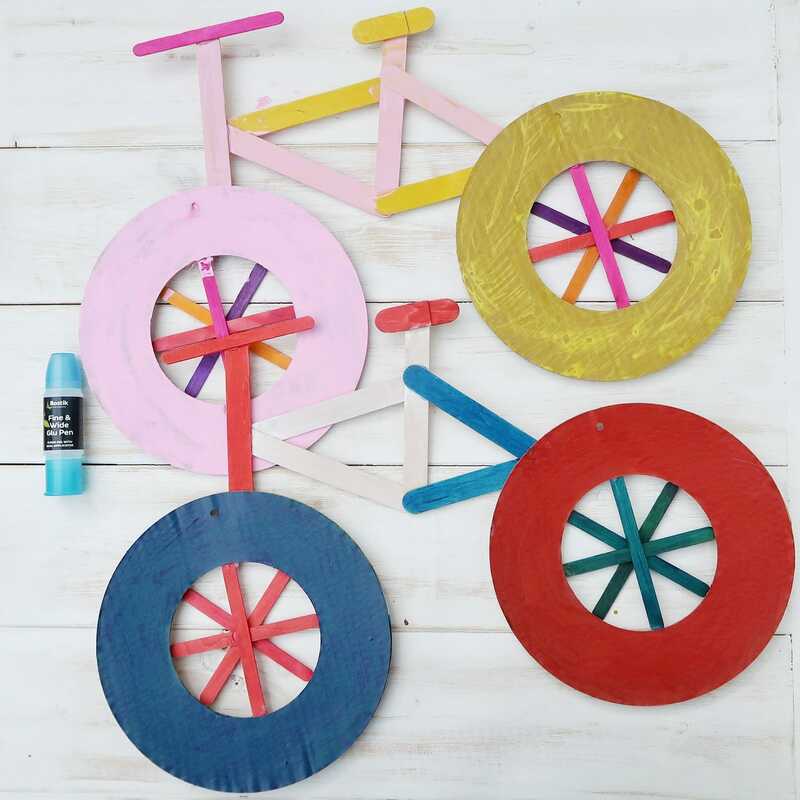 You can either paint the wheels and frame separately and then glue together, or create the whole bicycle shape and then let the kids go wild, decorating it however they would like. Above, you can see Littlest decorating her bike. She chose multicoloured lolly sticks for spokes and painted the rest of the bike pink and yellow. I also decorated a bicycle with her and I opted for Tour de France themed colours of blue, white and red. 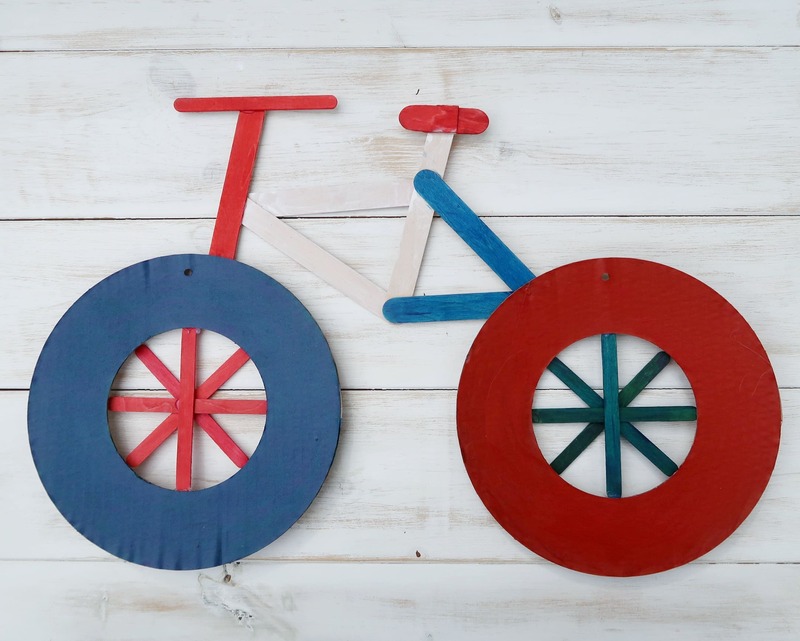 You could also make smaller versions of this bike, using smaller lolly sticks and cut up toilet rolls. This would make a great craft for the front of a greetings card. I think you could also use the bike as a kind of notice board. It would be easy to pin smaller items to the wheels and spokes. And there you have our Bicycle Craft in celebration of the Tour de France. Make sure you tune in next month to see the cyclists in action. For more of our craft posts, why not take a look at this Really Easy Unicorn Craft or this DIY Light up Model Solar System.